More families than ever are discovering the joy of traveling with multiple generations, including grandparents, cousins and maybe even great aunts and uncles. If you’re worried about keeping everyone in your brood entertained, we’ve got you covered with ideas that will thrill all ages — plus tips for taking advantage of your built-in babysitters (date night, anyone?). You’ll find that Colorado’s winter adventures are the perfect way to bring everyone together for some family bonding and memory making. Bring your cowboy and cowgirl boots — your whole crew will love stepping back into the Old West in Golden. Start at Buffalo Bill Museum and Grave to learn about this famed Wild West showman and frontiers­man, and stay for some hiking or picnicking at Lookout Mountain Nature Center & Preserve. Next stop: the Colorado Rail­road Museum. No dusty, roped-off relics here. You can stroll a 15-acre railyard and climb around on old train cars. November through December, their Polar Express Train Ride is a can’t-miss. The interactive excitement continues at Dinosaur Ridge, where young and old alike will enjoy self-guided or guided tours of excavation sites and exposed fossils. Every generation of music lover will enjoy a stop at Red Rocks Park & Amphitheatre, a legendary stage set among acoustically amazing sandstone outcroppings west of Denver (and the setting of U2’s famous “Under a Blood Red Sky” film and live album). Kiddos will love scampering up and down the amphitheater steps or hiking the surrounding trails, while adults will be fascinated by the Colorado Music Hall of Fame, including the famous John Denver Spirit statue. FAMILY-FRIENDLY EATS: Though an adventurous option (today is about adven­ture, after all! ), Sherpa House Restaurant & Cultural Center will win everyone over with a menagerie of Nepalese artifacts, a giant yeti and delicious stews, momo (dumplings) and Indian specialties. DATE-NIGHT ESCAPE: Named one of the most scenic restaurants in America by OpenTable, The Fort has both mountain views and twinkling panoramas of Denver’s distant skyline and serves finely prepared steaks, bison, seafood and game. If it’s postcard-perfect, snow-capped Rocky Mountain drama you want, and a charming mountain Main Street to go with it, Breckenridge delivers. 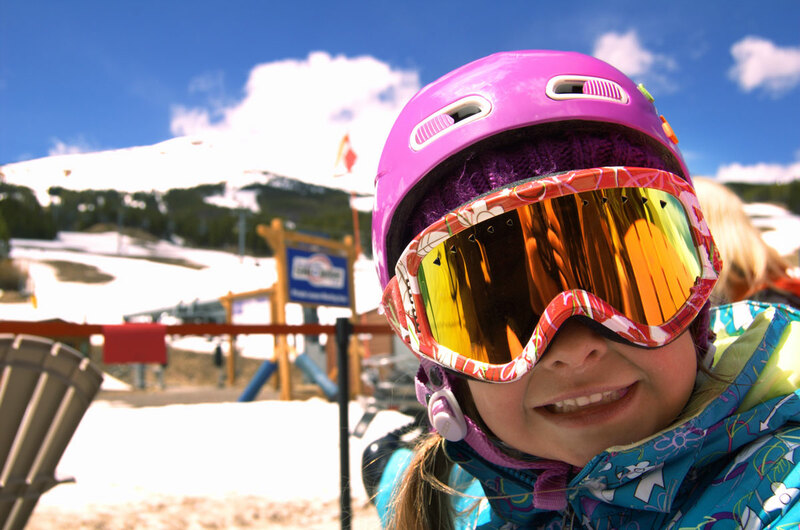 Launch your littlest skiers and boarders with lessons at Brecken­ridge Ski Resort, where the instructor-to-kid ratio is just 1:4. Sledding at Carter Park is a budget-friendly option (it’s free!) for snowy playtime, complete with epic views. FAMILY-FRIENDLY EATS: Three words: on-site arcade. At Downstairs at Eric’s, give the kids a pile of quarters, and order up some doughy, bubbly pizza pies. DATE-NIGHT ESCAPE: Reconnect over a sophisticated meal at Relish, starting with the charcuterie board or escargot, moving on to ruby-red trout and finishing with the to-die-for baked Alaska. STAY: Beaver Run Resort’s sprawling property is kid heaven, with a huge game room, an indoor-outdoor pool, several hot tubs and large suites and family rooms. Salida is one of those easy-going Colorado towns where you feel your pulse slow down the minute you roll in, and you find yourself joining in on the laid-back, outdoor-obsessed way of life. Make some time to browse the artsy, hip downtown shops and cafes, then follow in-the-know locals to the skiing and boarding experience at Monarch Mountain. The resort is a manageable size for families yet boasts plenty of excellent terrain — the perfect combo. FAMILY-FRIENDLY EATS: At the Boathouse Cantina, aim for a table by the window or on the patio so your gang can see the Arkansas River below. Make time for an after-meal walk along the boulder-strewn riverbanks. DATE-NIGHT ESCAPE: After supper with the fam, duck out and head to The Biker and the Baker for divine wine-and-dessert pairings. STAY: Retreat to the rustic Creekside Chalet and Cabins, which will put you at nature’s doorstep in cabins with multiple bedrooms, so you can all wake up and have breakfast together. If the first stop on your Colorado vacation is Denver, a no-stress way to head up to the mountains is to skip the car rental and simply head to Denver’s Union Station to be whisked up to the base of Winter Park Resort on the Amtrak Winter Park Express ski train (weekends, January–March). With more than 3,000 skiable acres and 25 chairlifts at Winter Park, your whole crew will be set to discover their brand of powdery bliss. FAMILY-FRIENDLY EATS: Make sure you have a couple of singles in your wallet when you head to Hernando’s Pizza Pub. You can decorate them with markers and add them to $20,000 worth of bills that already plaster the restaurant walls. Be sure to try your pizza “Colorado style” (with honey drizzled on the crust). DATE-NIGHT ESCAPE: A Moscow mule with house-made vodka and ginger syrup is just the ticket to melt away the chaos of spending the day with the fam. Idlewild Spirits Distillery also has savory bites like their famed Brussels sprouts with chili sauce. STAY: Initiate a new Colorado tradition at Snow Mountain Ranch, where lodge-style accom­modations please everyone and activities include a craft center, dog sledding, archery, ice skating, indoor rock climbing, campfire time and more. 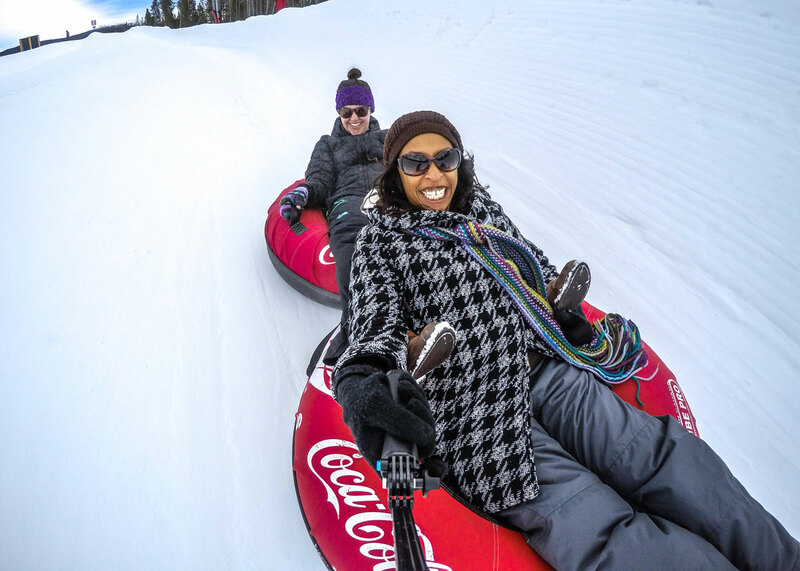 Photo credits: Coca-Cola Tubing Hill; Breckenridge Ski Resort.